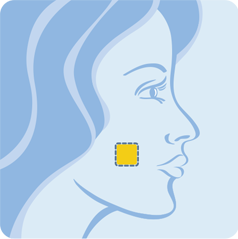 BELBUCA® works by sticking to the inside of your cheek and dissolving completely—typically within 30 minutes. BELBUCA® has a mild peppermint taste. Make sure your fingers are clean and dry. Tear open the foil package by folding on the dotted line and tearing down at the perforation, or by carefully cutting the package with scissors. 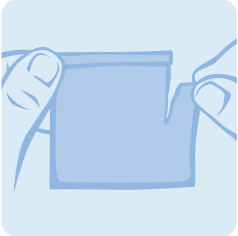 Remove the buccal film from the package. Wet the inside of your cheek with your tongue or with water. 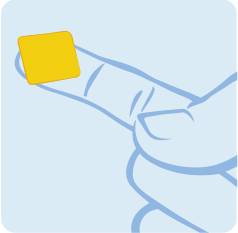 Place the film on a dry fingertip with the yellow side facing up. Press the yellow side against the inside of your cheek and hold in place for 5 seconds. Leave BELBUCA® on the inside of your cheek until fully dissolved, usually within 30 minutes. BELBUCA exposes users to risks of addiction, abuse, and misuse, which can lead to overdose and death. Assess patient’s risk before prescribing, and monitor regularly for these behaviors and conditions. To ensure that the benefits of opioid analgesics outweigh the risks of addiction, abuse, and misuse, the Food and Drug Administration (FDA) has required a Risk Evaluation and Mitigation Strategy (REMS) for these products. Serious, life-threatening, or fatal respiratory depression may occur. Monitor closely, especially upon initation or following a dose increase. Instruct patients on proper administration of BELBUCA to reduce the risk. Prolonged use of BELBUCA during pregnancy can result in neonatal opioid withdrawal syndrome, which may be life-threatening if not recognized and treated. If prolonged opioid use is required in a pregnant woman, advise the patient of the risk of neonatal opioid withdrawal syndrome and ensure that appropriate treatment will be available. A long-acting opioid pain medicine that can put you at risk for overdose and death. Even if you take your dose correctly as prescribed, you are at risk for opioid addiction, abuse, and misuse that can lead to death. Get emergency help right away if you take too much BELBUCA (overdose). When you first start taking BELBUCA, when your dose is changed, or if you take too much (overdose), serious or life-threatening breathing problems that can lead to death may occur. Taking BELBUCA with other opioid medicines, benzodiazepines, alcohol, or other central nervous system depressants (including street drugs) can cause severe drowsiness, decreased awareness, breathing problems, coma, and death. Never give anyone else your BELBUCA. They could die from taking it. Store BELBUCA away from children and in a safe place to prevent stealing or abuse. Selling or giving away BELBUCA is against the law. pregnant or planning to become pregnant. Prolonged use of BELBUCA during pregnancy can cause withdrawal symptoms in your newborn baby that could be life-threatening if not recognized and treated. breastfeeding. Not recommended during treatment with BELBUCA. It may harm your baby. taking prescription or over-the-counter medicines, vitamins, or herbal supplements. Taking BELBUCA with certain other medicines can cause serious side effects and could lead to death. Do not change your dose. Apply BELBUCA exactly as prescribed by your healthcare provider. Use the lowest effective dose possible for the shortest time needed. See the detailed Instructions for Use for information about how to apply BELBUCA. Do not apply BELBUCA if the package seal is broken or the film is cut, damaged, or changed in any way. After the film has adhered to your cheek, avoid eating or drinking until the film has completely dissolved, usually within 30 minutes. Avoid touching or moving the buccal film with your tongue or fingers. Do not chew, swallow, snort or inject BELBUCA. This will result in uncontrolled delivery of buprenorphine and may cause you to overdose and die. Do not stop using BELBUCA without talking to your healthcare provider. After you stop using BELBUCA, remove any unused film from the foil pack and flush down the toilet. Throw the empty foil packaging in the trash. Drive or operate heavy machinery, until you know how BELBUCA affects you. BELBUCA can make you sleepy, dizzy, or lightheaded. Drink alcohol or use prescription or over-the-counter medicines containing alcohol. Using products containing alcohol during treatment with BELBUCA may cause you to overdose and die. nausea, constipation, headache, vomiting, dizziness, and sleepiness. Call your healthcare provider if you have any of these symptoms and they are severe. Manufactured for: BioDelivery Sciences International, Inc., Raleigh, NC 27612, www.BELBUCA.com or call 1-877-579-4578.